I've been working with Steve Wexler and the eLearningGuild on the eLearning 2.0 survey and report. Some interesting data points are coming out of the study. Right now there are more than 1000 respondents. 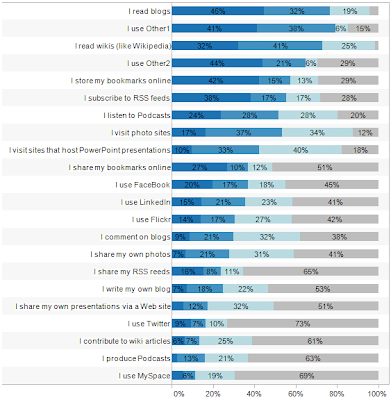 I've not really seen good numbers on what people are using as part of their day-to-day lives. Here are some numbers that confirm a bit of what we thought and a few surprises. More coming on this. Much more blog reading that I expected. 62% read at least weekly. Interestingly RSS readership for "weekly" only adds up to 41%. There's clearly a gap here around the use of RSS readers. I'm really amazed at the gap between people who store their bookmarks online 53% vs. those who share bookmarks online: 23%. Most people who store their bookmarks, don't share them. That's a surprise. I guess they must be using a lot of tools other than delicious. 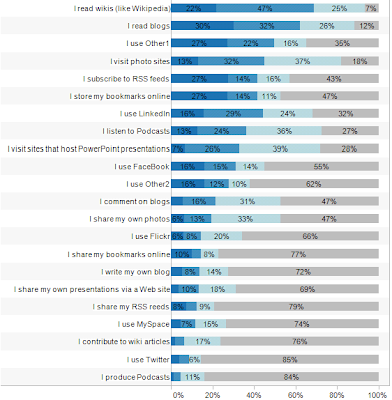 LinkedIn was shown as being used monthly or more by 68% which is higher than I would have expected. I personally get a lot of value out of LinkedIn, but I wonder if other people are getting that same value. Facebook use is higher than I would have thought. MySpace is clearly behind in the corporate eLearning world. Twitter adoption is higher than I would have thought. Clearly Education is ahead of Corporate adoption, otherwise the numbers are fairly well aligned. Then to compare with adoption by people in Government. Despite the stereotype, people who work in government were clearly able to think outside the box and make their top choices Other1, Other2 and Other3. Government is much more like Education in adoption than Corporations. Given many of the challenges they face, I would have thought that adoption would have been more like corporations. Plaxo, YouTube, LearningTown, del.icio.us/delicious, Picassa, Ning, Google Docs/Google Apps, Second Life, Blogger, iGoogle, orkut, FriendFeed, Internal workplace community, PBWiki, Xing, Digg, Friendster (really? ), Pageflakes, Photobucket, Snapfish, Diigo, gather (? ), gmail, Google Reader, Instant Messaging, istockphoto, LiveJournal, Multiply, Netvibes, Pandora, Wetpaint, Wikipedia, Wordpress. Obviously, many people who marked other were using tools that fit into the categories above. But we clearly missed an opportunity to ask about community tools like Ning. Podcasts, Twitter, Slideshare, Flickr, MySpace, LinkedIn, Facebook, Wiki, RSS, RSS Reader, Wikipedia, delicious, del.icio.us, blogs. I find it interesting the number of people that use facebook. Just a question: was there other data that you could compare on more traditional tools such as e-mail, listserv or discussion forums? Also, will the data have age linked to it in the future (I realize this is preliminary) to determine if there are generational differences? Also, can you give us some examples of what "other" might be? There was data on that collected a while ago. I'm not sure we could get a fair comparison, but it's a good question. Maybe Steve will have thoughts on this. We did ask about differences among different age groups. And I'll post on that in the future. Other items listed, great question - let me update the post. Before reading this post, i was thinking that only corporations are ready to accept eLearning 2.0 technology. However the results shocked me, Its the education sector using eLearning 2.0 technologies most. Thanks for sharing this good piece of information. Also can you please put some thoughts around Rapid eLearning development technologies, it would be great help. 2) how do you vet podcasts? in other words how do you create your knowledge management filter.